Earlier this week, NPR reported that the U.S. Mint will make 3 billion coins in 2009, as opposed to the 10 billion it created in 2008. It's the smallest amount in 50 years, the flagging retail economy is the reason. That information in itself is interesting, but as it turns out, the U.S. Mint may be making a mistake. In a completely unrelated story, NPR -- the day after its Mint story -- reported that studies have shown that people have a tendency to spend smaller denominations of money far more easily than the psychologically-daunting larger amount of cash. Probably not a surprise to anyone who spends money. Ergo, concluded one of the researchers interviewed by NPR, if we want the economy to get going, the government should give out spare change, or at least money in smaller quantities. For instance, if they really want the public to spend a stimulus check, send it $20 at a time, versus in one lump sum. At the same time, even though we probably all intuitively know that it's easier to rationalize breaking a $5 bill instead of a $50, it's useful information to remember. While the American and global economy may need us to collectively spend, individuals at the same time need to save more and shop smarter. 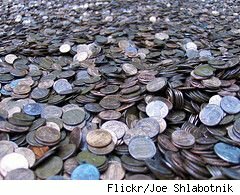 So the next time you have a pocketful of change and feel a burning need to get rid of it as quickly as possible, keep in mind that you're employing a financial strategy that, in the end, makes both no sense and no cents.